Bud Industries is the best known electronic enclosure manufacturer in the United States. 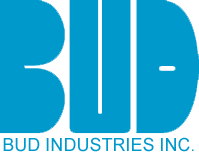 With products meeting the needs of customers with 19 inch cabinets, NEMA boxes, IP65/IP66/IP67 enclosures, communications cabinets, small metal enclosures and accessories, Bud can provide virtually any electronic enclosure or electrical enclosure solution. From steel to aluminum, from plastic to fiberglass, the Bud line is the most extensive in the industry. Bud will also customize their products to allow for turn-key installation.